 Post index - 01531 Vantaa. 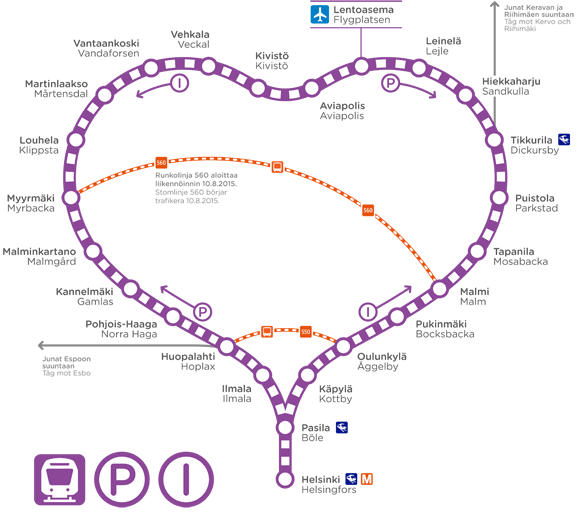  Easiest way to reach from Helsinki city center is to take P or I commuter train. In T2 terminal the table of arrivals and departures is at the second floor near the entrance. There are five big parkings near the entrance. 1, 2 and 3 are closer to the terminals and are more expencive. To find parkings 4 and 5 you should turn right after exiting the T2 doors and walk straight. It is about 7 minutes walk. All you need to do is to follow the signs. From the railway station the easieest option is to take train P or train I. Airport is Lentoasema in Finnish. It is usually translated to English and also has a specific ✈ plane ✈ sign. You current location is shown on the display, so you will not miss the stop. But even if you miss - the ticket is valid for 80 minutes, so you can easily take another train. It takes about 3 minutes. You need to take an elevator upstairs. Then keep right. Usually everyone goes there. Relatively long elevator will eventually lead you to the airport terminals. Then you need to follow the signs to the terminal you need e.g. to T2. Without change you can travel with Lux Express that usually stops at platforms 22 and 23. Manual on how to find these platforms is here. If you are traveling by train - you need to leave train at Tikkurila stop and continue with train I.